To us, this probably just looks like a rubber band. Or maybe, given the wielder’s hand placement, one of those Chinese jump rope loops we were obsessed with in the 90’s. But why the contemplative squint? 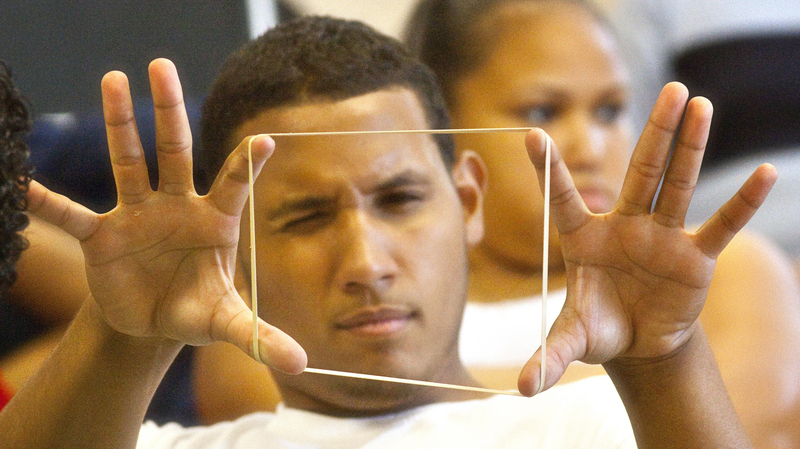 For this student and others at the Big Picture Alliance, a local nonprofit dedicated to educating underserved youth in the art and science of media-making, this simple stretchy rectangle transforms—voila!—into the purview of a camera lens. Try it yourself: look at the world through a makeshift frame, and you might start to think like a director, an actor, or an editor. If you’re as awesome as the kids at Big Picture, you might even make your own movie. Sound cool? Tomorrow (June 23) you can join BPA for their first ever Summer Film Jam at the Asian Arts Initiative Gallery & Theater, 1219 Vine Street, from 5:30-7:30 p.m. The screening will feature student-produced work from throughout the 2010-2011 school year, including documentaries, public service announcements, and narrative pieces. There’ll be 14 pieces altogether: three longer ones (12-20 minutes) and the rest ranging from 30 seconds to seven minutes. One of the films, “The Jerk,” was chosen as a winner by MiNDTV/Philadelphia Stories, Season 8. There’ll also be refreshments and, of course, time to mill around, chat with participants and colleagues, and celebrate sweet summertime. Something else Dwight said stuck with me: “Our students are aware that if they don’t like what the media is portraying, they don’t have to passively sit and be content but can make their own media as a response.” So it’s not just about playing with cameras—it’s about understanding messages, taking them apart, and then putting in your own two cents. Which, as we here at the Media Ed Lab know for sure, is worth a lot more than two cents. Seating at the Jam is limited, so hurry and RSVP to Brittany Barbato: Brittany@bigpicturealliance.org. Please bring at least a $20 donation, or if you’re a student, just your ID and your enthusiasm will do. See you tomorrow!